In October 2013, animal rights activists in the Bay Area launched a campaign -- "It's Not Food. It's Violence." -- focused on Chipotle by performing a "die-in" at a San Francisco location of the restaurant chain. The campaign uses creative demonstrations to challenge the food industry's violent and deceptive practices. See here for details on our next monthly day of action. 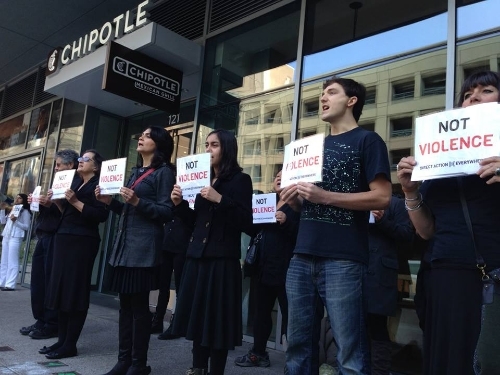 Protesters at a San Francisco Chipotle location. - Chipotle is a fraud. Chipotle claims that it treats animals with “love” and “integrity," and its CEO has publicly declared, "It’s our promise to run our business in a way that doesn't exploit animals." Yet the act of killing is inherently violent and exploitative. Chipotle engages in humane washing, selling the idea that violence can be humane. Moreover, meat industry publications show that the company purchases meat from the same concentrated animal feedlot operations (“factory farms”) as other fast food chains. - Chipotle is one of the largest animal killers in the world. The company, a former subsidiary of McDonald’s, has a market capitalization of over $16 billion and has grown in recent years at a phenomenal rate -- nearly 1000% in the past five years alone. Up to 95% of its sales involve violence against animals.